Captain Mark Adamshick, USN (ret) is the Class of 1969 Chair for the Study of Officership at the Simon Center for the Professional Military Ethic, United States Military Academy, West Point, NY. 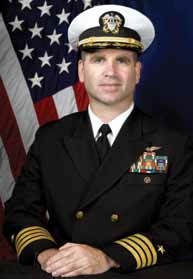 From 2007 to 2011 he was the Director, Division of Leadership Education and Development and senior military professor of leadership and ethics at the United States Naval Academy. A graduate of the Naval Academy class of 1981, he was a commissioned officer in the United States Navy for thirty years. Captain Adamshick is a Naval Flight Officer and Naval Test Pilot School graduate (Class 93) and has accumulated over 3000 flight hours in over 25 different aircraft. A "TOPGUN" graduate, he has over 1000 carrier arrested landings in fighter aircraft and has flown over 100 combat missions over Libya, Iraq, Afghanistan and the former Yugoslavia. He has commanded an F-14D "Tomcat" squadron (VF-213) and an F-18E/F "Super Hornet" squadron (VFA-122) and was the operations officer of the nuclear powered aircraft carrier USS Theodore Roosevelt CVN-70. He has served in a variety of high level staff positions including the deputy flag officer assignment officer to the Chief of Naval Personnel and the head aviation warfare policy officer to the Chief of Naval Operations in the Pentagon. Captain Adamshick has a Masters degree in public administration from the Harvard Kennedy School of Government and earned his Ph.D. in policy studies, specializing in management, finance and leadership, from the University of Maryland, School of Public Policy.